Maybe DV will recapture the heat record for the world once again. Death Valley holds the world heat record of 134F recorded on 7/10/1913. The old record of 136.4F recorded at Al Azizia, Libya, on 9/13/1922 has been disallowed. There are some who say that the DV record is also doubtful, but at the moment it stands. For my part, living here in Vegas, I'm ready for a break from these "excessive" temperatures! Supposedly the "excessive heat warning" ends this evening. But forecast highs will still be 105+ as far out as the NWS forecast goes. I think I'm ready for a break, maybe I should go up to the White Mountains for a few days. Except if I do, I guess I'll get smoked out by the CA fires. I'm no meteorologist, so there may be a perfectly logical explanation for these readings being legitimate. Agreed, the 1913 low temperatures in that chart look way off. Especially when you contrast them to the lows over the last week or so. And moreso when you look at the information in that article, comparing the FC readings to other data points. Having said that though, last October I spent a couple of days in the northern part of Desert Nat'l Wildlife Refuge. It got up to 80 or so each day, but the night in between (I was camped near Desert Lake) it dropped down to 29 degrees! Those readings came from my Jeep's external thermometer (which seems fairly accurate) and were confirmed by my own senses. Lingenfelter has a discussion regarding the record high in his book DEATH VALLEY & THE AMARGOSA. I believe official standards for instrument boxes have changed since then. 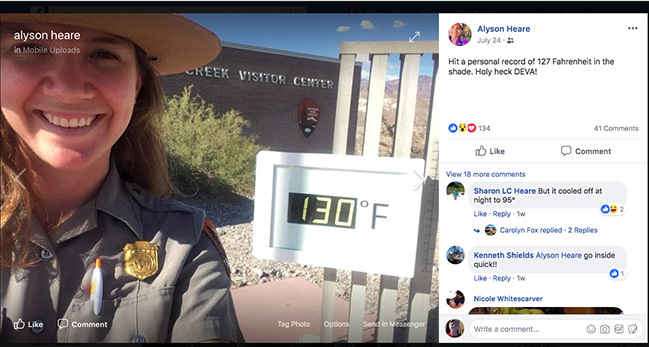 Ranger Aly Heare at 130 degrees in front of Vistors Center 7/24/2018. Note that Aly says it was 127 in the shade so there was a three degrees difference in the official vs. the VC display? The thermometer for the display is not the same as the one that meets official standards. Wow, and Scotty's is still closed from the Oct. 2015 storms! 100 degrees at 8:00 AM Forecast to reach 121 at FC.